Ancient relics that the author inherited from his grandparents. A chest full of fragments of bones of unidentified saints enclosed in small boxes, these objects probably date back to the 18th century or perhaps they are even older. 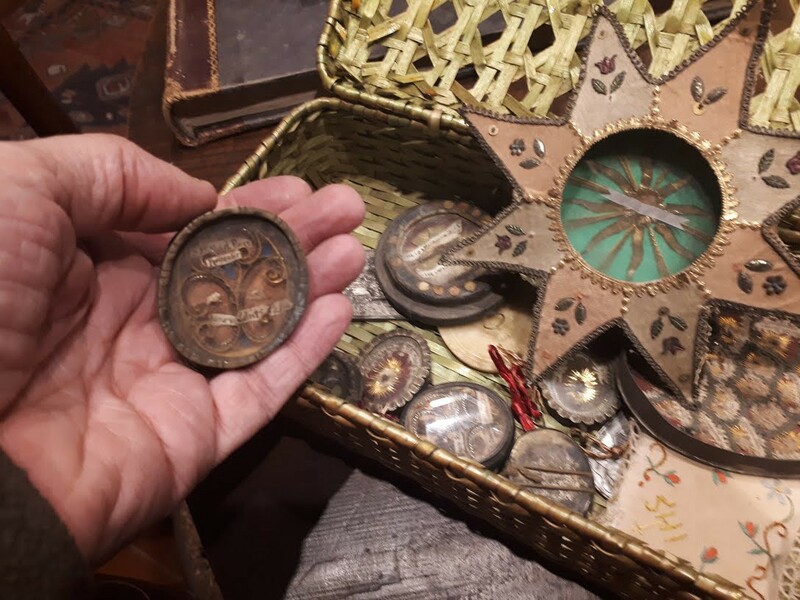 Relics were supposed to be venerated, but note also the shape and size of the containers: they look like coins and, in a certain way, they were. This hoard of saintly relics was a small treasure that the family kept in the same way as today some people keep gold coins and jewels. Today, these objects have no commercial value just like money out of circulation. Published by INSURGE INTELLIGENCE, an investigative journalism platform for people and planet. Support us to report where others fear to tread. Maybe you think that bitcoin and the other cryptocurrencies are a completely new form of currency. After all, nothing like that could ever exist before the age of Internet, right? Well, not exactly. It is true that the modern cryptocurrencies are based on the Internet, but the basic concept of “virtual currency” predates the Internet, by at least a millennium. During the Middle Ages, people made an extensive use of a virtual currency in the form of holy relics. It is a story that needs to be told from the beginning. First of all, all human societies are kept together by money. Without money, there cannot be commercial transactions, and without that no complex society can exist. But the same technology that created the empire also doomed it. When the imperial mines ran out of precious metals, the Empire ran out of money. That generated a complex chain of events and the agony of the Empire lasted for a few centuries. But the origin of all the troubles was simple: it was a financial collapse. No money, no legions — no legions, no Empire. Then, the Middle Ages came. An age of the scarcity of precious metals, it was not by chance that it saw the birth of legends involving dragons hoarding gold in their lairs. People desperately needed some kind of money. But what to use if gold and silver were mostly gone? The Romans of imperial times had already tried virtual currency — for instance paying their soldiers with pottery. Eventually, the last breed of Roman troops were simply paid with food. But these ideas didn’t work very well, as you may imagine. The disappearance of the Western Roman Empire didn’t eliminate the need of some kind of currency. Something that could play the role of money was desperately needed and it was found: relics! Yes, exactly that. The bones of dead holy men (and women) had all the characteristics of money. They were rare, hard to find, limited in quantity, had no value of their own, and they could be traded, exchanged, and hoarded. They were also supposed to have thaumaturgic virtues but, really, they were the true currency of the Middle Ages. The church had the power of determining whether an object claimed to be a holy relic was real or not, so it acted in some respects as bank. It validated relics, even though it couldn’t create them (not explicitly, at least). But that was enough to play a pivotal rule in the medieval financial system. The papacy gradually lost its power grip in Europe only when new mines in Eastern Europe provided enough precious metals for coinage. Relics were much of a virtual currency, just like bitcoin. They had no more substance than the stuff dreams are made of. Nobody could really tell whether a fragment of bone claimed to be holy came from a cow or holy man. Nobody could tell whether a wood splinter was really a chunk of Christ’s cross. To be sure, the Church could declare (or deny) the authenticity of a specific relic; but it was still a declaration wholly based on faith. It was all virtual: a game of make-believe, just as today is the case for all kinds of money, including bitcoin. But if money is a dream, don’t discount its power. Dreams (and money) are what keeps human societies together. Bitcoin — or some other form of cryptocurrency — is the new money. Maybe it will turn out to be a nightmare, but maybe it will help us keep our dreams alive. To give you some idea of the craze for relics that had overtaken our ancestors, let me translate for you an excerpt from the book by Edgarda Ferri “The Great Countess” (“La Grancontessa”) (2002) which tells the story of Countess Matilda of Canossa. All this takes place around the year 1000 in Europe. Note how the relics are mined out with some effort (just like bitcoins) and how the pope acts as the “bank”, validating the find. But note also how, just as in the case of bitcoins, it is not the bank (the church) that creates the new money. This particular trove of relics was created by group of citizens (“miners”) of Mantua who had the resources and the clout needed to carry the enterprise to completion, eventually involving in the game even the Pope and the Emperor. And nobody dared to cast doubts on the improbable story. Longinus the Roman soldier pierced with his lance the side of Christ on the cross on the Golgotha. Out of the wound, there poured blood mixed with water which, falling on his sick eyes, suddenly healed him, converting him to the Christian faith. Searching for safety, Longinus arrived in Mantua carrying with him a little box which contained a sponge and a fistful of sand soaked with lumps of the blood that came from Christ’s body. He was martyred by the Romans outside the walls of the city, in the place that today takes the name of Cappadocia. All traces of his body were lost for a long time. 800 years later, on a summer night, the apostle Andrew appeared to a Christian of Mantua and showed to him the place in the garden where Longinus had buried the precious box. 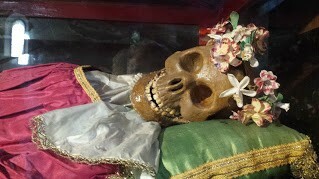 The Mantuans dug there, found the relic, and they also found the bones of the martyr. The very Christian king Charlemagne charged the pope to go there to have more precise news. The Pope examined the find, released a document, he declared the relics of the holy blood to be authentic, dedicated to them an oratory near the hospice of St. Madeleine, ordered that the day of the ascention the relics were to be exposed to the veneration of the believers. In the end, he brought with him a little of the holy soil to give it to the Emperor as a gift, who devoutly deposed it in the royal chapel of Paris.